Alexandra Pirici. Parthenon Marbles, ongoing action 2017. Commissioned by Future Climates and Kadist. My introduction to the programming of Future Climates’ The School of Redistribution at State of Concept Athens was a fitting one; my travelling companions and I had hurriedly trudged up the Acropolis to see Alexandra Piricci’s introductory performance Parthenon Marbles, dodging groups of tourists as we took in the beauty of the overgrowth that is given relatively free reign to insert itself within and around the structure. The scene was messy – buzzing with life. A woman, distinguished by her ‘Official Tour Guide’ button and proficiency in several languages, hawked her tour to various restless visitors who were unwilling to stand in line for 15 minutes. Effervescent groups of students floated down the paths alternately listening listlessly to their teachers and excitedly taking photos of one another. Contracted men with dust masks picked their way through the relic as a group of preservationists argued loudly in Greek from within the Parthenon, barely visible through scaffolding surrounding the monument. Given that the performance was an unauthorized action, the organizers had stressed to all attendees that they be punctual lest the authorities stop the performance only minutes after it had begun. In this sense we were very lucky. The performance’s total running time is roughly half an hour and it was not cut off until around twenty-five minutes in. At that point, one of the aforementioned workingmen in dust masks strode aggressively through the scene and demanded that a permit be presented. He was succeeded by a short squat woman (the perfect image of an imperious bureaucrat) who yelled ‘No Pause!’ further confusing the audience due to the ambiguity of whether she was demanding that the show go on, that the performers not pose, or that in her anger she had simply left behind a comma. As the performance disintegrated and the performers re-integrated into the role of visitors, what followed was a sadly typical institutional reaction to art in public space in Athens. The bureaucratic woman, complete with a silly (but practical) floppy sun hat, chastised the organizers for staging an unauthorized event and threatened audience members with a lawsuit if we did not delete the photos we had taken. Attendees gather outside of State of Concept after the event. Visible within the gallery is Future Climate’s representative graphic, Navigating the Numbers, a site-specific wall painting in gouache by Navine G. Khan-Dossos commissioned by Future Climates. When I spoke afterwards with Future Climates co-founder Antonia Alampi, she told me that this was not the first performance in public space in Athens that she had seen similarly shut down by the authorities. While it is practically impossible to get a permit for the Parthenon – even when one’s message echoes that of the Greek government, cultural institutions, and other individuals whose private for-profit tours are permissible – there seems to be a general skepticism about non-commercial art in public space. 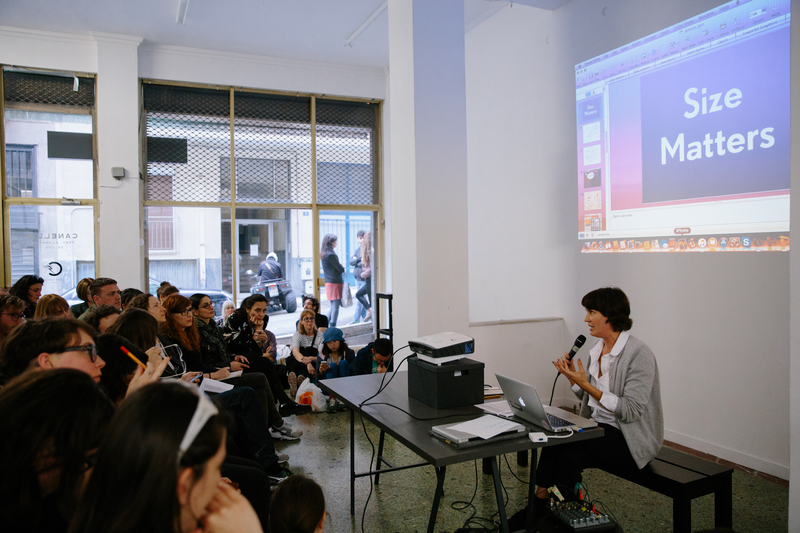 Future Climates is a platform initiated by Antonia Alampi and iLiana Fokianaki that tries to map the financial microclimate of the art world and better understand the contingent financial circumstances of cultural producers and institutions – towards finding new means of distributing wealth and resources. 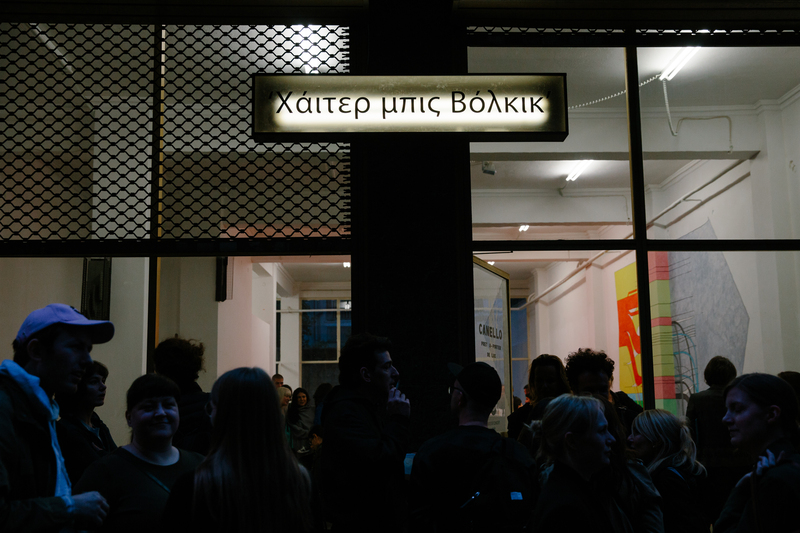 It was launched at State of Concept Athens with The School of Redistribution, a three-month long exhibition, research and public program. 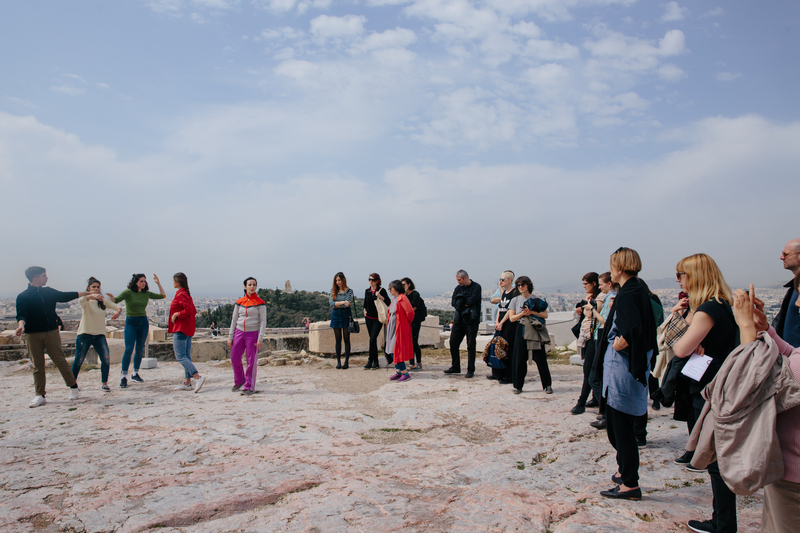 The opening public program of The School of Redistribution lasted from 11am at the Acropolis to 9:30 pm at State of Concept and consisted of morning/early afternoon performances of Alexandra Pirici’s Parthenon Marbles followed by an introduction to the discursive program and six lectures/presentations in which different cultural workers discussed their projects and positions on issues of precariousness in the art world. Respondent Mohammad Salemy challenges Olav Velthius’s ideals for ethical financial redistribution. After an effective and impassioned introduction from co-founders iLiana Fokianaki and Antonia Alampi and head-researcher Evita Tsokanta, the first presentation by Olav Velthius fell rather flat for me – partially because of some technical difficulties with an online exercise, and because of a larger disconnect between his very strict parameters for the redistribution of funding and the precarious realities of Greece and other so-called ‘underdeveloped’ or developing countries. Other speakers in the program were also bothered by this disconnect. Both Mohammad Salemy and Angela Dimitrakaki asked whether using ‘dirty’ money for liberatory projects addresses this problem and added that in countries such as Greece (where there is no established state support system for art institutions and artists), there is not much one can do to avoid it. And, of course, Alexandra Pirici’s performance and Victoria Ivanova’s presentation of her work also introduced questions of whether state money and state institutions could be considered ‘clean’ if they depend so heavily on stolen works to attract donations, visitors, and renown. 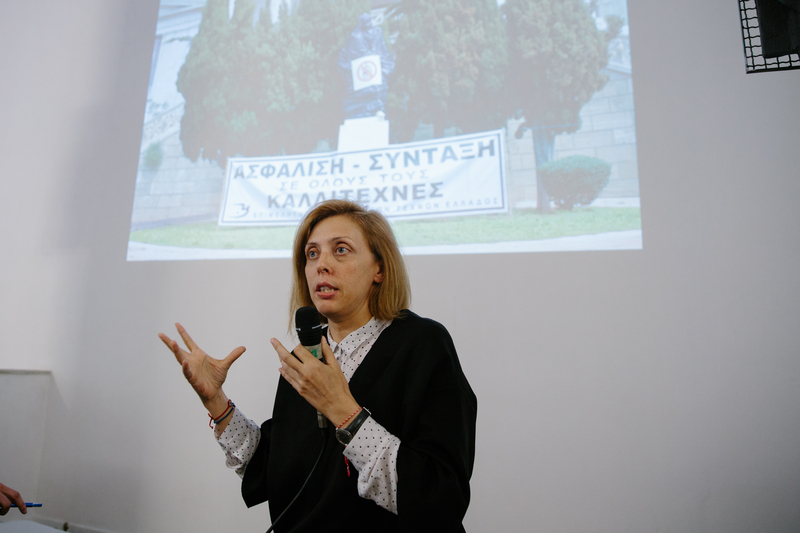 Elpida Karaba presents the work of the Association of Cultural Workers (SEP), an official body that advocates for the support of labor rights of cultural workers in Greece. While the first part of the day seemed to be mostly founded on theories and ideals, the second part was made up of stories and diagrams of how existing spaces and initiatives have worked to create new structures and realities in which artists can better sustain themselves and in which diverse communities can be better served. The speakers for the second part of the program included the Association of Cultural Workers (SEP), an official entity that campaigns for the rights of Greek artists and cultural producers; Emily Pethick, director of The Showroom in London; Maria Lind, director of the Tensta Konsthall in Stockholm; and Julieta Aranda and Anton Vidokle of e-flux. These presentations were fascinating for their diverse approaches to precarious conditions, in the best cases taking into consideration both the needs of local communities as well as resource constraints. Some pertinent questions included: How to respond to financial systems given that ethical purity is not possible and that different stakeholders have different priorities? (SEP); How can spaces within a location/region collaborate even though funding structures often force them to be in competition with one another, and how can we sustain networks given that funders don’t want to fund the same project twice? (Emily Pethick); How do we keep in mind the importance of artistic rigor and maintain quality while also thinking about working conditions and political concerns? (Maria Lind); and How can capitalist structures be re-wired to support revolutionary artworks/practices? (e-flux). 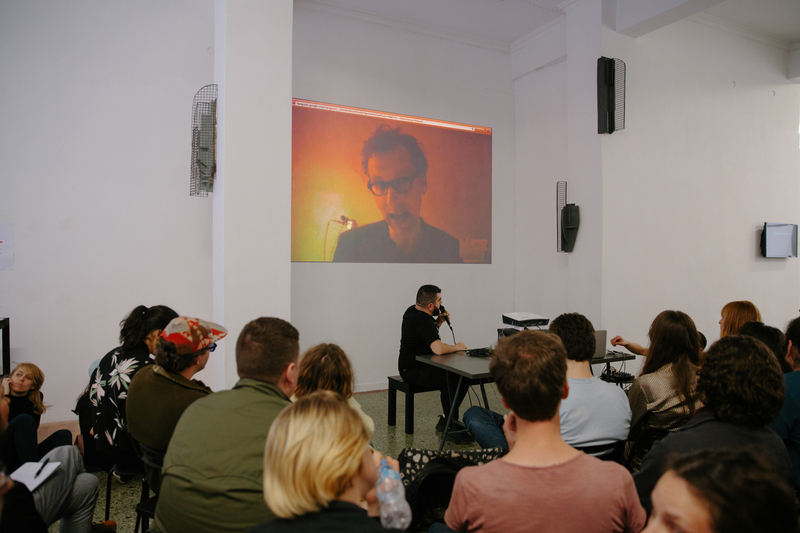 Given the topic and that it was one of the few programs preceding the Documenta press conference and preview, The School of Redistribution attracted a large and diverse audience, ranging from young journalists to established artists and curators, and also including some Athenians. While there were some question and answer portions, more often than not they were dominated by questions coming from the speakers rather than from the audience, and were too short to accommodate more than one audience question. Emily Pethick, director of The Showroom in London, discusses the research paper Size Matters, which criticizes dominant modes of measuring value in the art world. Due to this pacing, it ended up being less of an opportunity to workshop new forms and structures for the future, and more of an extended lecture program. There was enough content in this one opening session to have stretched it over three days and offered more opportunity for reflection and audience participation. This is my greatest criticism of the program, which was otherwise rather brilliantly conceived and well executed. However, given the context of the opening week of Documenta, in which art engagement has the volume and pace of a competitive eating contest, it is understandable that the opening program of The School of Redistribution was so dense. At its best, Future Climates is an enveloping eco-system that seeks to create a new network of cultural producers whilst engaging in rigorous and critical research of existing financial structures and systems, rather than simply being a series of programming. As such, I believe that the fruits of the project will be slow developing, but ultimately deeply enriching. Audio documentation of Future Climates’ The School of Redistribution is available via State of Concept Athens on Mixcloud. Pia Chakraverti-Wuerthwein is a curator, researcher, and artist living and working in Berlin. Her main project at the moment is the weekly yearlong film series how does the world breathe now? at SAVVY Contemporary, the concept of which was written by Bonaventure Soh Bejeng Ndikung and of which she is one of the curators, along with Antonia Alampi and Elena Agudio. In her spare time she has been working on a concept for a conceptual book-making lab against the rise of the far right, preparing part of her Bachelor’s thesis for publication, and making films.